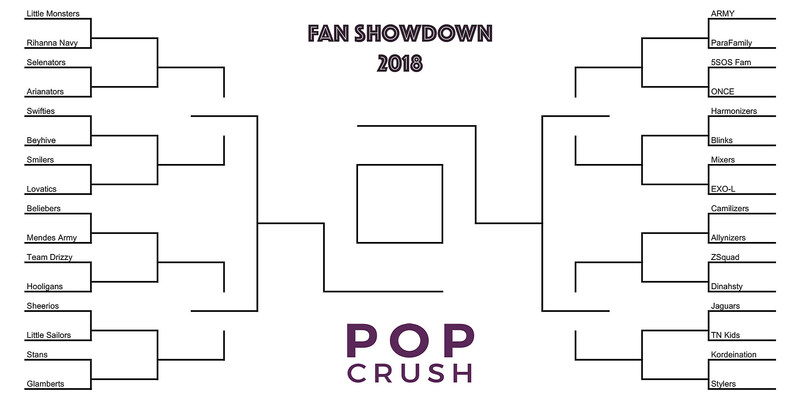 PopCrush's 2018 Fan Showdown is a month-long competition to determine the most dedicated fan base. Solo artists, groups, and ex-group members will all face off until a winner is crowned on May 1. Female pop stars command some fierce fandoms to be sure, but whose fan base is the fiercest of them all? Is it Lady Gaga's intensely devoted Little Monsters? Beyoncé's fervent Beyhive? Taylor Swift's ever-faithful Swifties? We're putting it to the test. Round 1 of the competition begins today (April 3) and ends on Tuesday, April 10 at noon; Round 2 begins April 11 at noon and ends on April 16 at noon; Round 3 begins April 17 at noon and ends April 22 at noon; the Final Four begins April 23 at noon and ends on April 25 at noon; and the winner of the final showdown will be revealed on May 1. You can view the full bracket here and vote in each quadrant below. The battle begins now!